How fantasic and beautiful!! There is same festival in my local area, but scale is different. This is much bigger than our area’s one! How nice that You loved my photos; I am really glad when reading Your praising comment. Thank You. Very nice surprise to read that You have followed my blog and loved my photos. ha: i like that — your own mini-festival in the glass ! Muito obrigado pelo seu comentário que me gosta. Thank You for Your kind comment. I love it. Uma boa semana! Have a nice week. 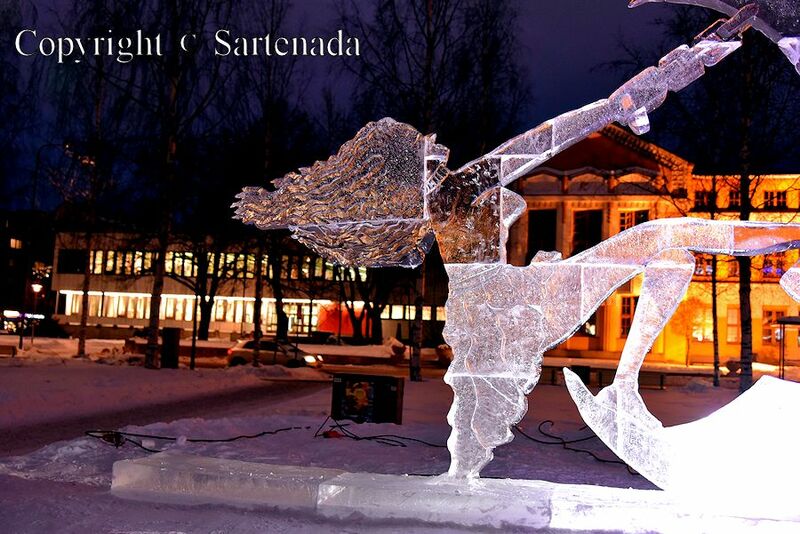 All the works of art of the ice are wonderful. When a color changes, I look like a different work. 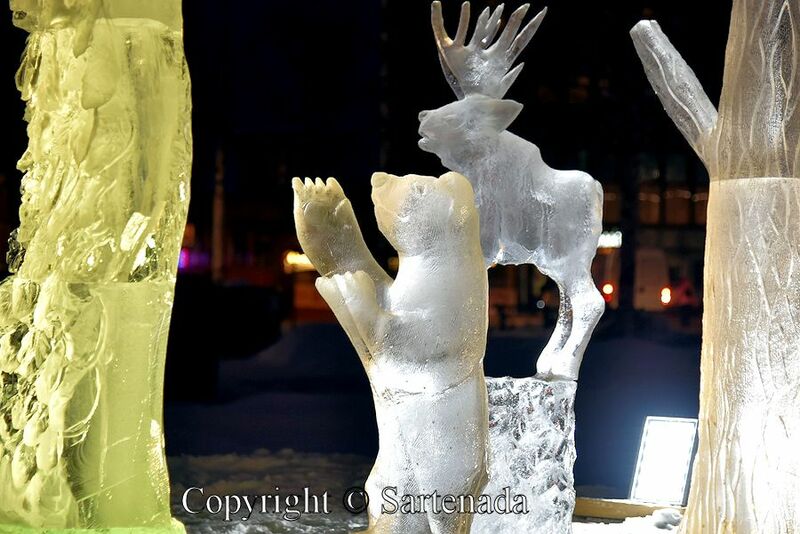 I was also “amazed” how different colors can change these ice statues. Thank You leaving praising comment. I am glad that You loved my photos. I visited them the same day when the competition was over. After few days the weather came “warm” and they started to melt slowly. 🙂 Thank You. Well, actually felt I sorry when seeing them vanishing so soon. Thank You. Wonderful! I love the girl and the cat! How nice that You found Your favorite among my photos. Thank You for your kind comment. i liked that too — especially the colored-layer-effects ! Your captures are really amazing, thank you! Thank You for Your visit and leaving so nice comment. Interesting how different they can look with the different lights. Yes, indeed. These verify how lights can change things very much. Thank You commenting! 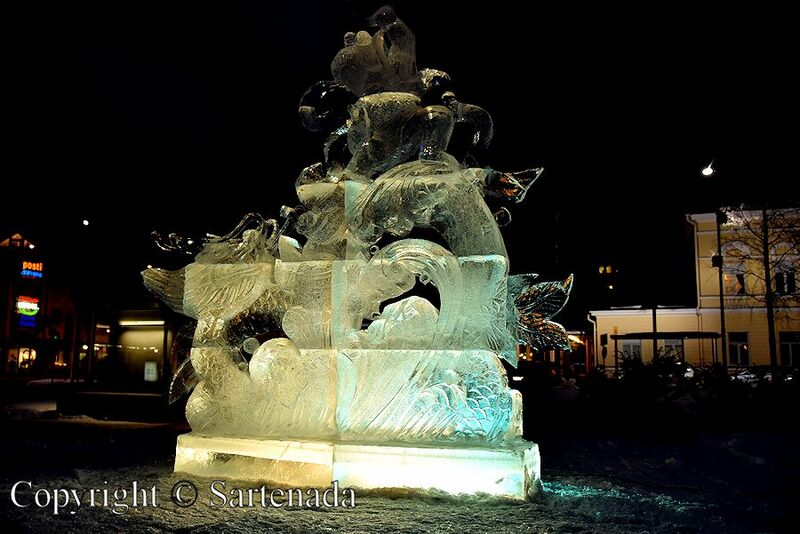 Ice sculptures are beautiful in daylight, but magical at night when lighted. Your photos are fantastic. It’s dynamic but delicate& Beautiful. When the color of the light is different, an impression also changes, doesn’t it? You are right! I am glad that You loved my photos and left Your praising comment here. ありがとうございます. C’est vrai et un peu triste. Merci d’avoir fait le comentaire. I enjoyed your amazing photos so much. 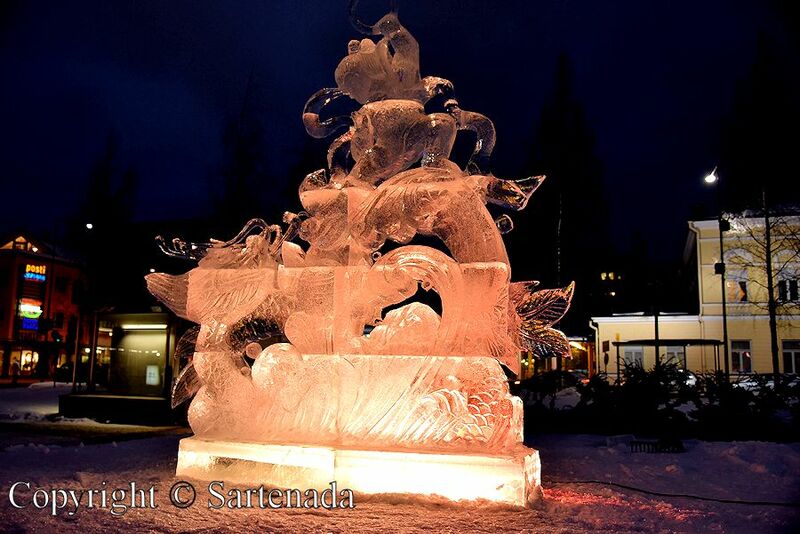 Ice carvings have a special visual quality that no other art form has. 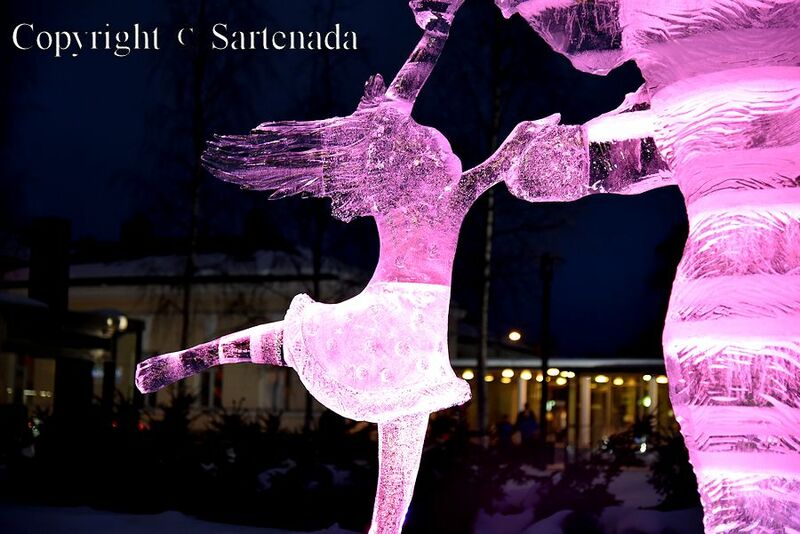 These are so lovely – the ice skater is my favorite. Thank you commenting so nicely and visiting my blog! I was sad after few days when the warm weather started to melt them. Happily photos stay! 🙂 Thank you for Your kind comment. de nous les faire découvrir. Voici un commentaire vraiment sympa que j’ai reçu! Merci beaucoup. 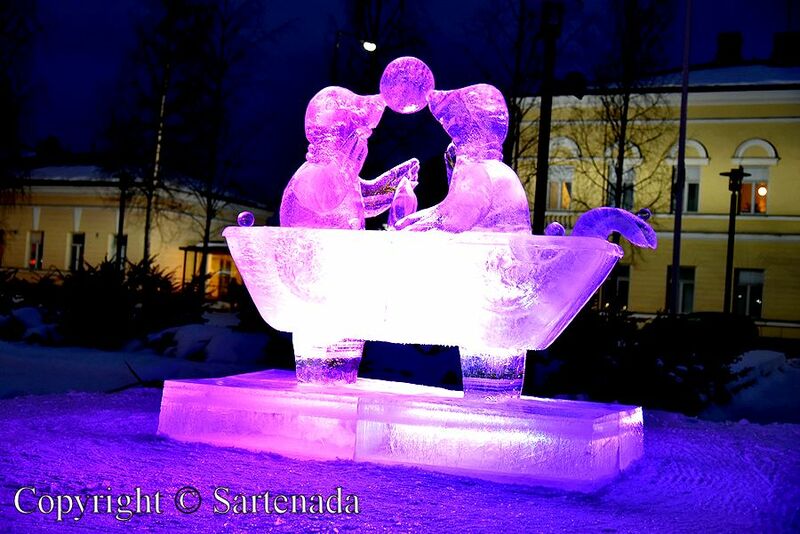 These sculptures are so, so beautiful …! Incredible that carving can be such a filigree work! Love it! Thanks for taking pictures and showing them here on your blog. Have a nice evening, Matti. Thank You. My pleasure. I am glad that You saw these ice arts thru my post. Now they live only in Internet. The cat is my favorite one! 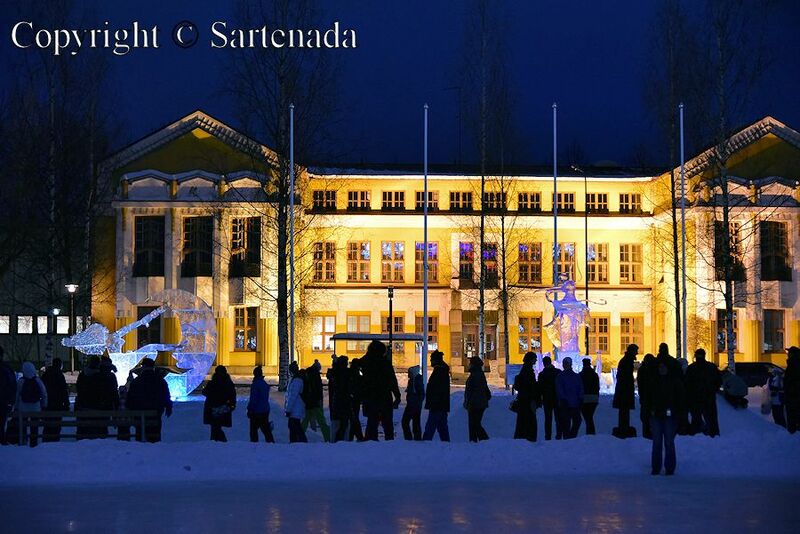 I like how they all change colors in the evening with the different lights. Than You loving my post. I am very glad for Your visit. 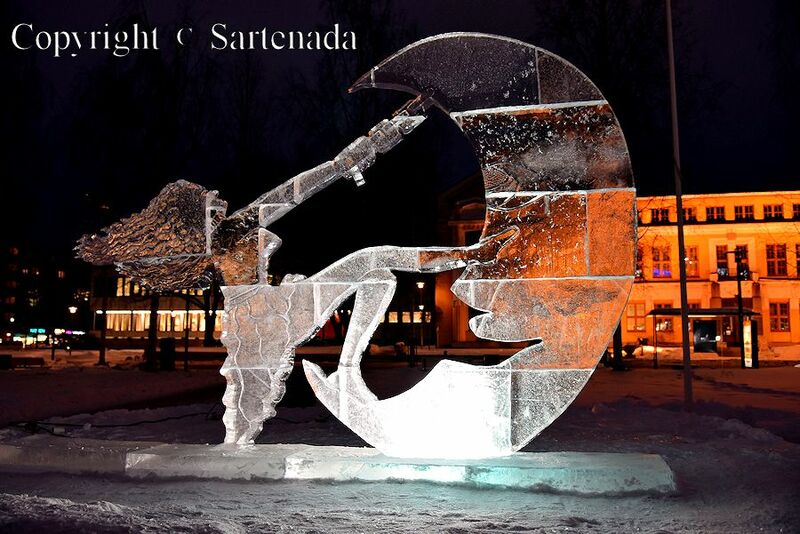 I change the light that illuminates the ice sculpture is fantastic. 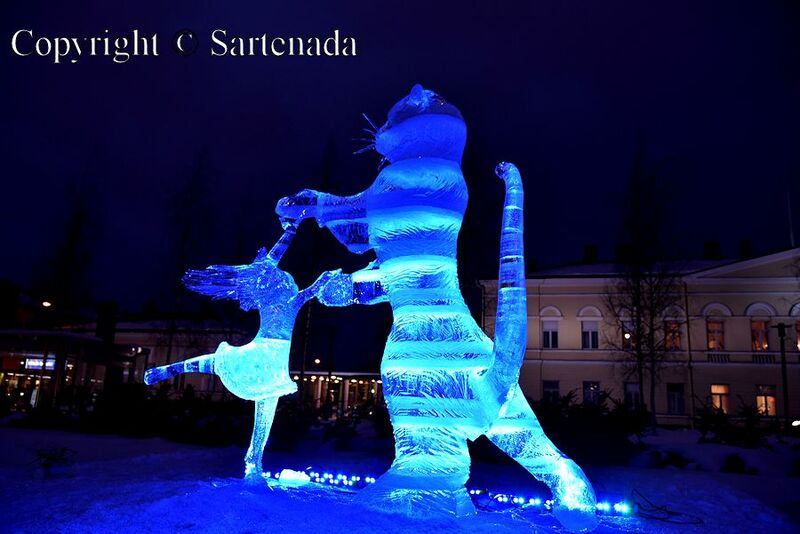 I like the image of the girl and the cat is dancing. How glad I am when reading Your praising comment. Thank You. 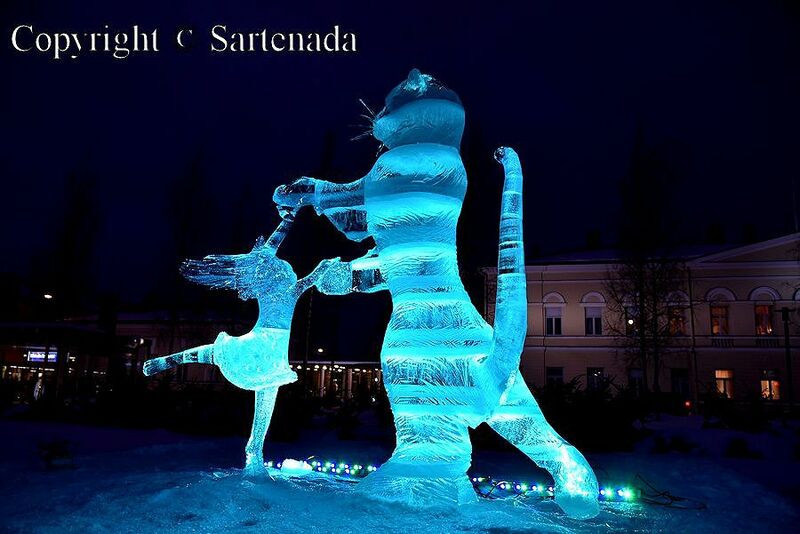 Amazing the sculptures! You did a wonderful job of getting the light right on the photos to show the colors on each one. The different colors increase the number of carvings because they are so different in the different colors. I appreciate very much Your praising words. Thank You. 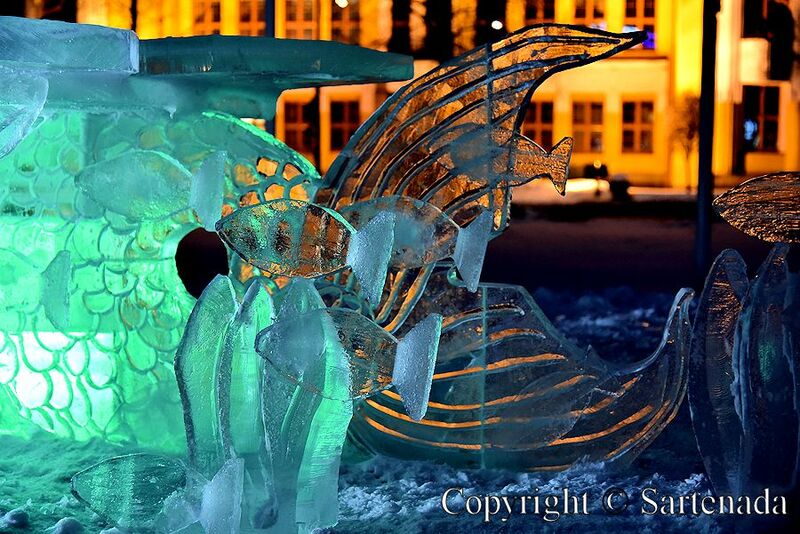 I am amazed at the detail that can be carved into the ice. 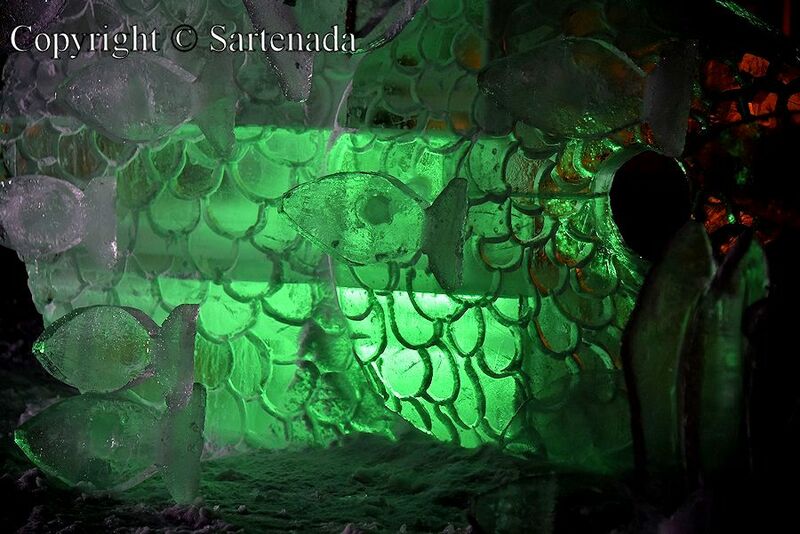 The colored lights make the carvings seem to glow from the inside out. Beautiful photos, Matti! 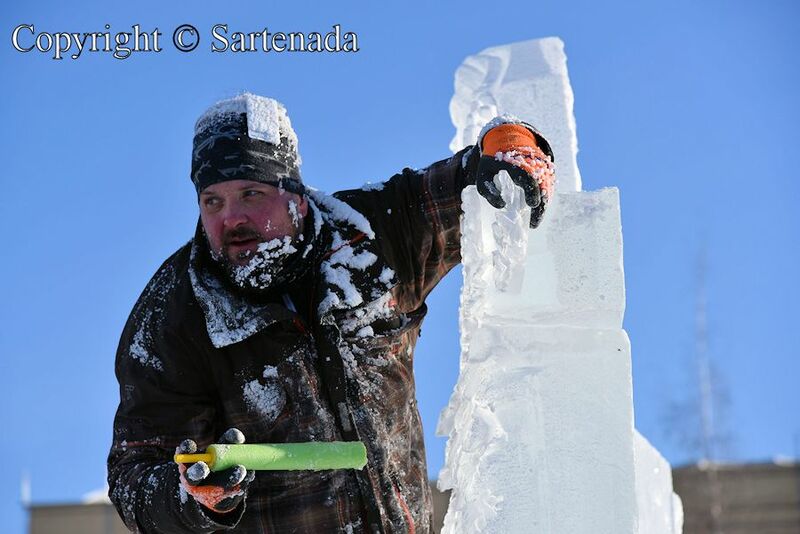 I was also amazed how precise details man could make when carving ice. I am glad that You loved my post. Thank You. Vos mots aimables éclairent ma journée ici dans le Nord. Comment agréable il est de commencer la journée après avoir lu votre remarque élogieuse. Merci beaucoup. Muchas gracias por compartir estas obras de arte y felicidades por la calidad del reportaje fotográfico. Qué alegría al leer que te haya gustado mi post. Muchas gracias. Gorgeous pictures – the colors make them look very different. They are all beautiful! It is indeed fantastic that colors have so big effect. Thank You for Your praising comment. You all certainly know how to enjoy winter. These sculptures are impressive in their detail and the obvious skill required to create them. Well, You are right, but now we wait for spring and summer. 🙂 Thank You commenting so nicely! Well done, I know they are not easy to photograph, especially at night. 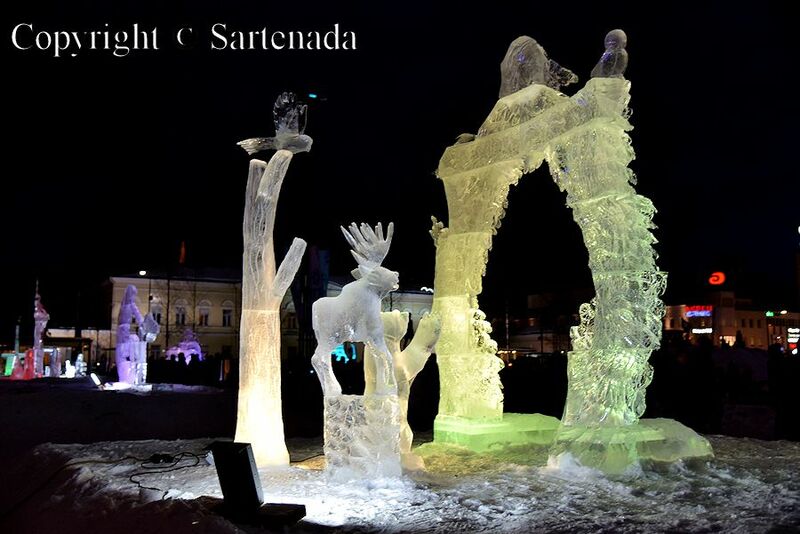 They look quite big, the lighting is great and shows up the artist’s crafts very well. It looks as if everybody had fun. Yes, indeed, night photos are difficult and I shot these photos handheld. Thank You for Your praising comment. 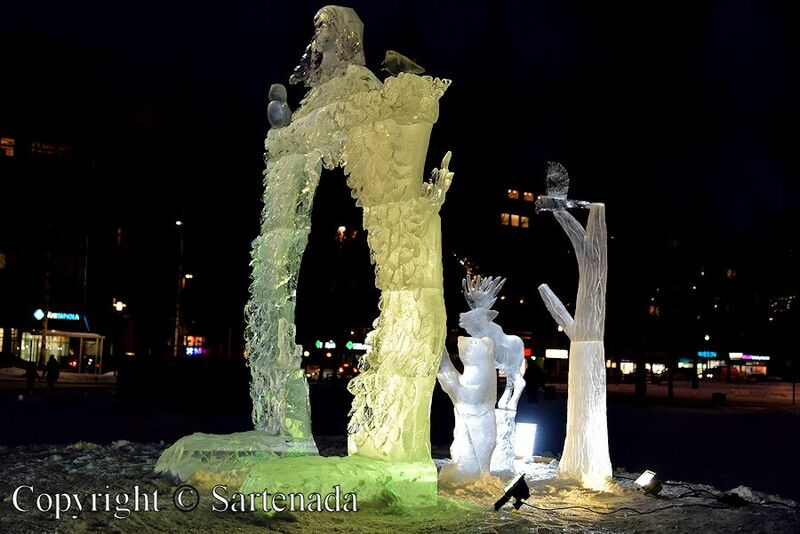 Fantastic sculptures! 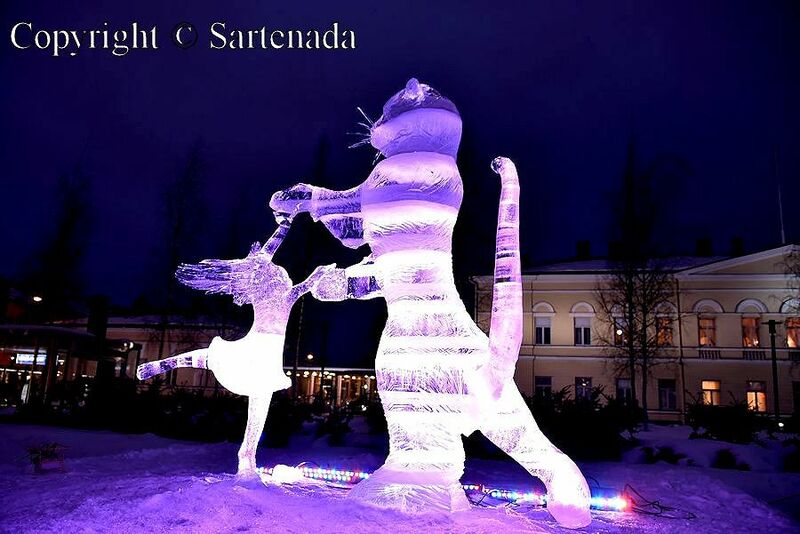 And the light really makes them come to life! What a nice event you had. The pictures are gorgeous! It was a great pleasure to read Your praising comment. Thank You. 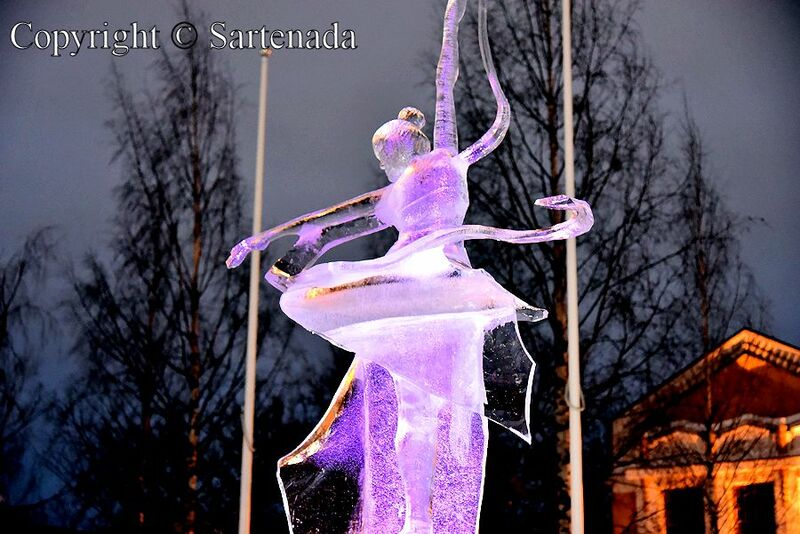 Ice statues are very good! 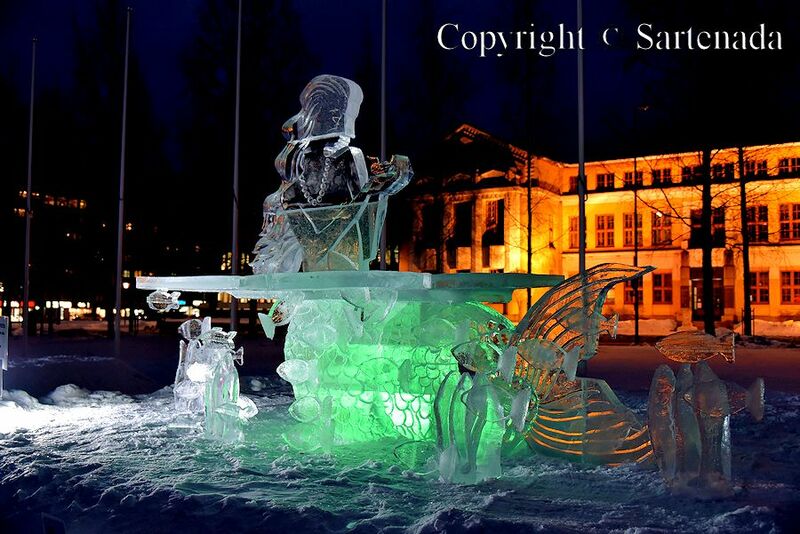 Simiral festival opening in Sapporo, Japan. Very that You left Your kind comment here. I checked Your link – gorgeous photos. Thank You. I am glad that You visited my blog again. Thank You leaving so nice comment. 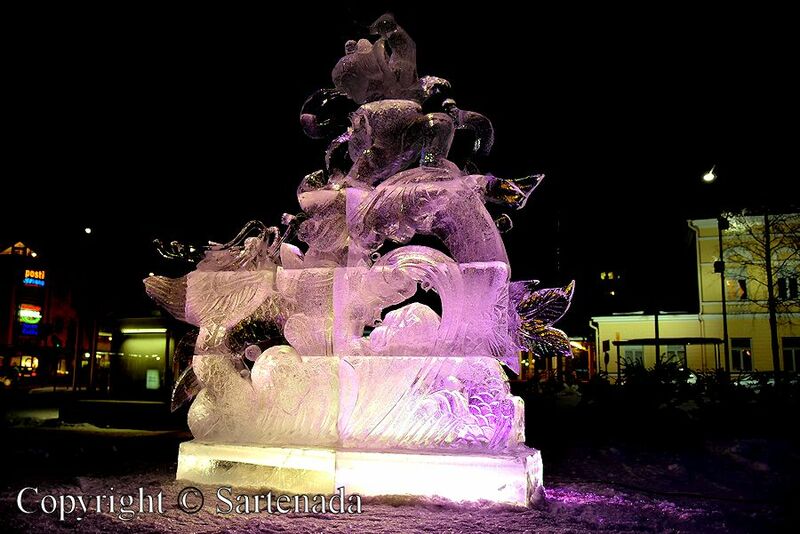 The colored lights do make the snow sculptures prettier. How nice to read Your kind comment. ありがとうございます. Wow! 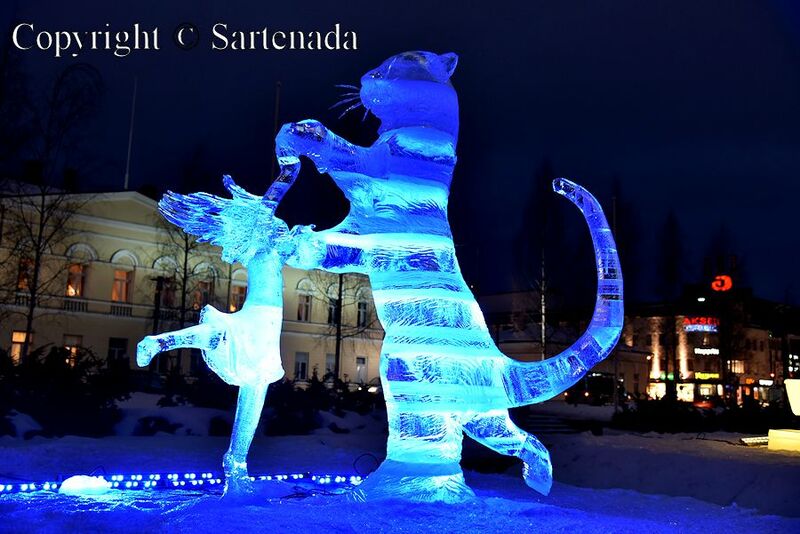 How fantastic – these are just amazing, and you are right…..the color in the ice sculptures brings them to life! I love the one of the girl and the cat, and the girl and the moon. 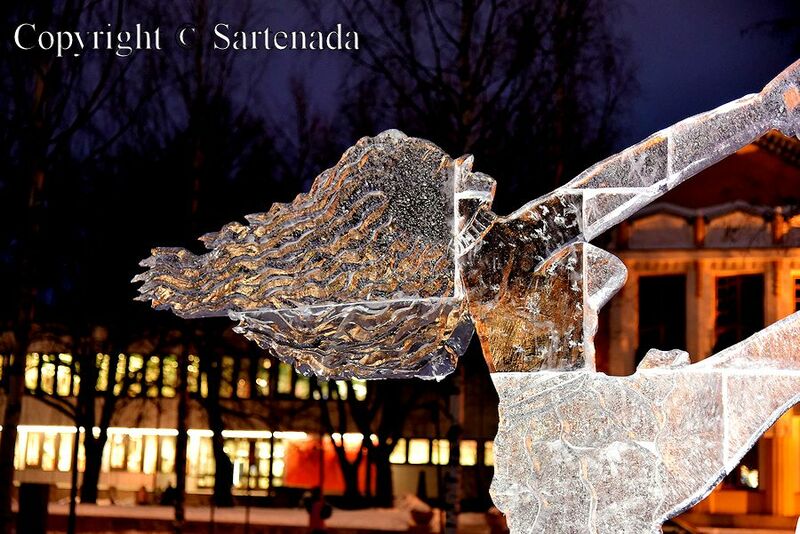 All the people who sculpted these are very talented, and you are a brilliant photographer! What a pleasure to read your praising comment. Thank You. Sorry being so late to answer to Your comment. We spent a nice small Holiday on Madeira, Portugal. I hope you had a wonderful holiday, Matti. Thank you for all of Your kind comments You left here. I am very glad that You loved my photos. Bonjour Matti! 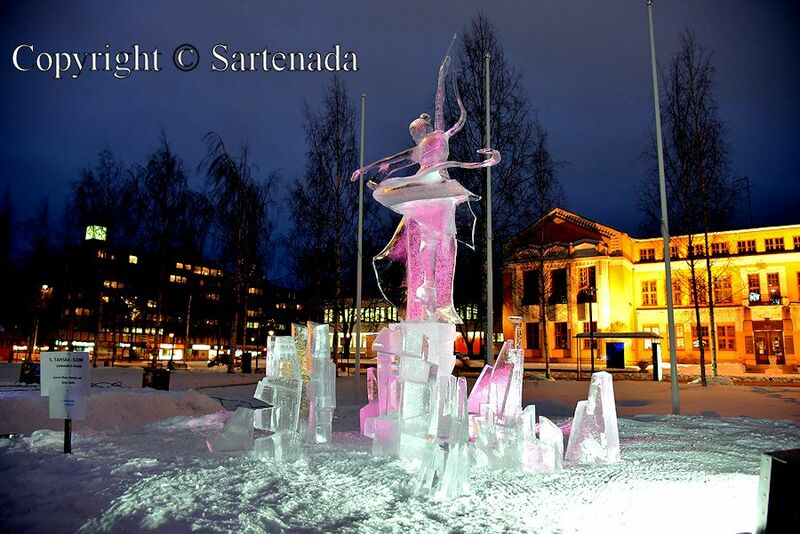 How beautiful the ice sculptures are by night with all the coloured lights shining through them. Your photos are really lovely. 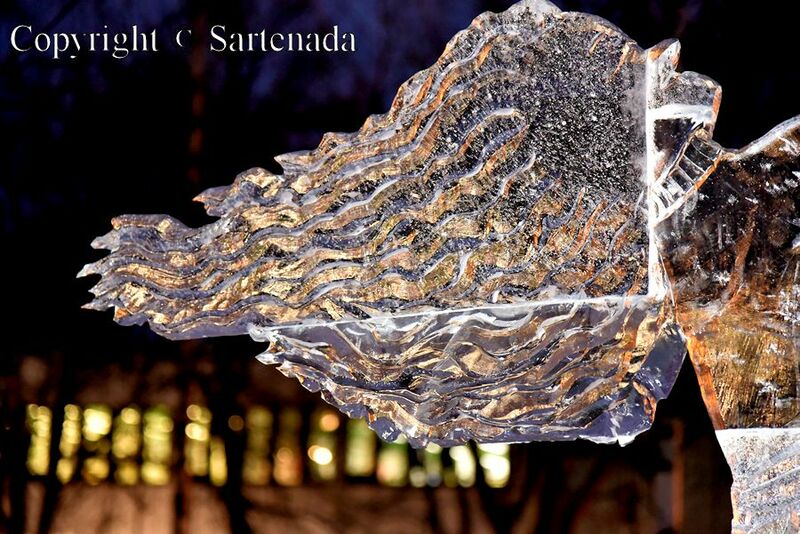 I am very glad that you snow my ice art photos and left Your kind comment. Thank You. They were as You told in Your very praising comment. 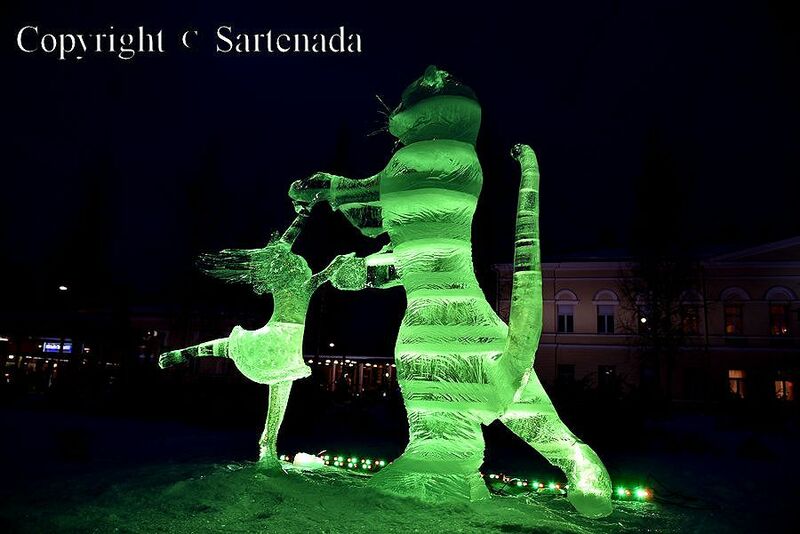 I am really glad when reading that You pleased ice art in my home town. Gorgeous photos, thanks for the tour. 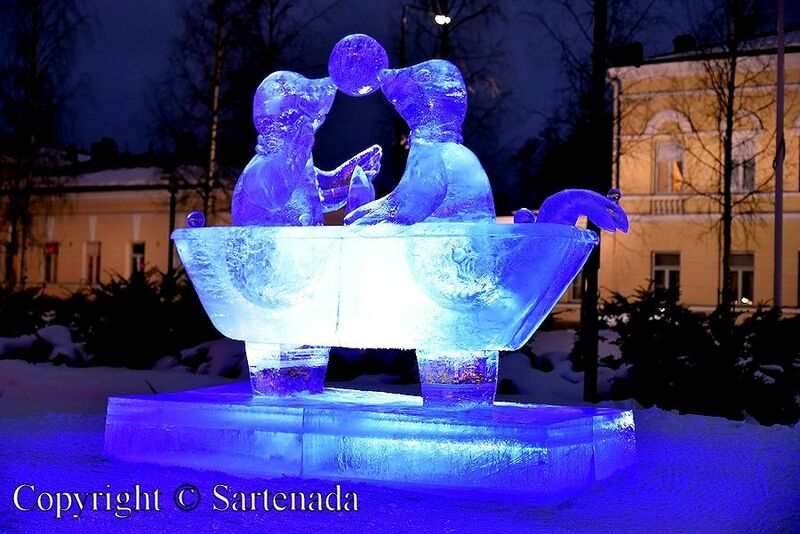 I am very glad that You loved these ice sculptures. It is a pity that their life cycle is short. Anyway photos stay! Thank You commenting so nicely. 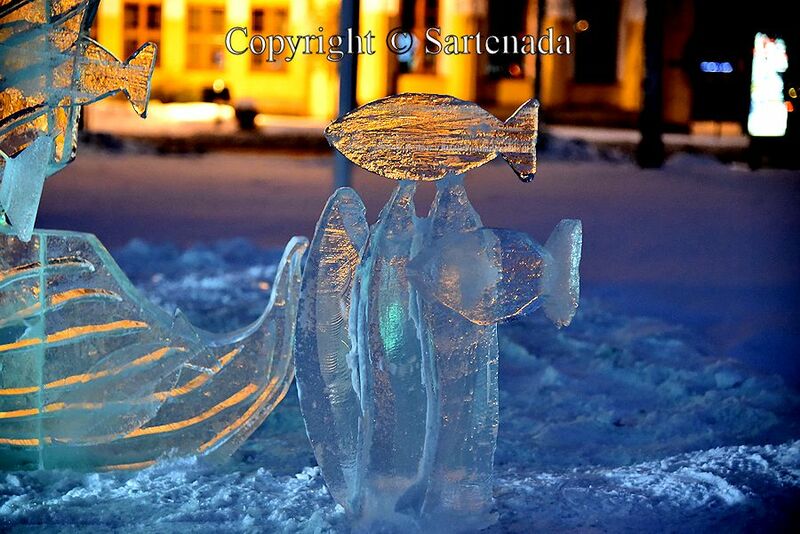 I like these Ice sculptures very much, there are wonderful photos. How nice to read Your kind comment. Vielen dank! 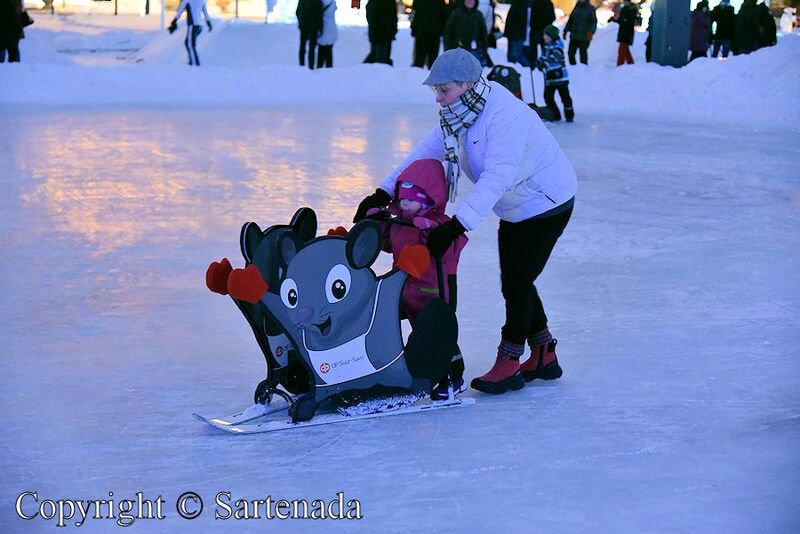 Your photographs are beautiful, and what fun was had on the ice! I am glad that You loved my photos. I am not used to shoot evening / night photos, but probably I managed well. Thank You. Looks great! Wish we had this kind of stuff in Helsinki, it’s supposed to be the capital, after all! 😉 With work and money restricting me (domestic travel is expensive), I doubt I’ll ever visit these exhibitions… unless I win the lottery, hahah! 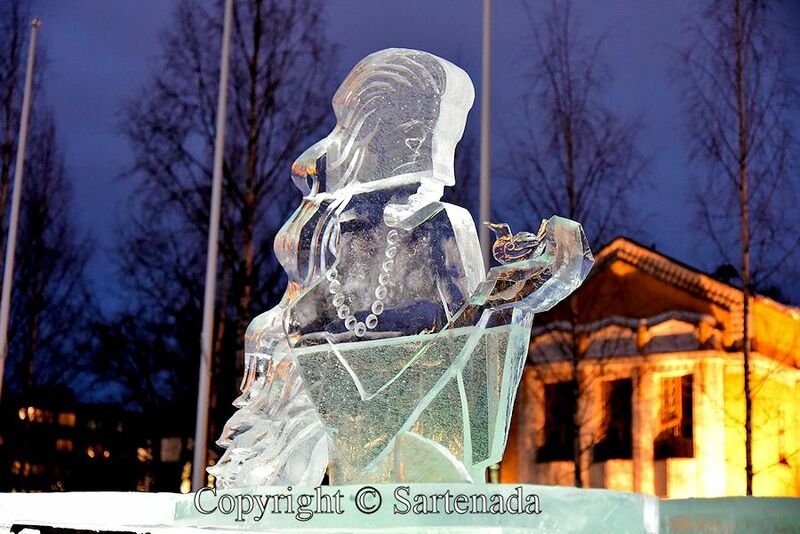 😉 Maybe I should be the one to initiate this in Helsinki… I could start an ice sculpture club of my own!? Hi The Snow Melts Somewhere. Thank You. Nowadays is quite “cheap” to travel by train. Many years I took night train to Kemi. 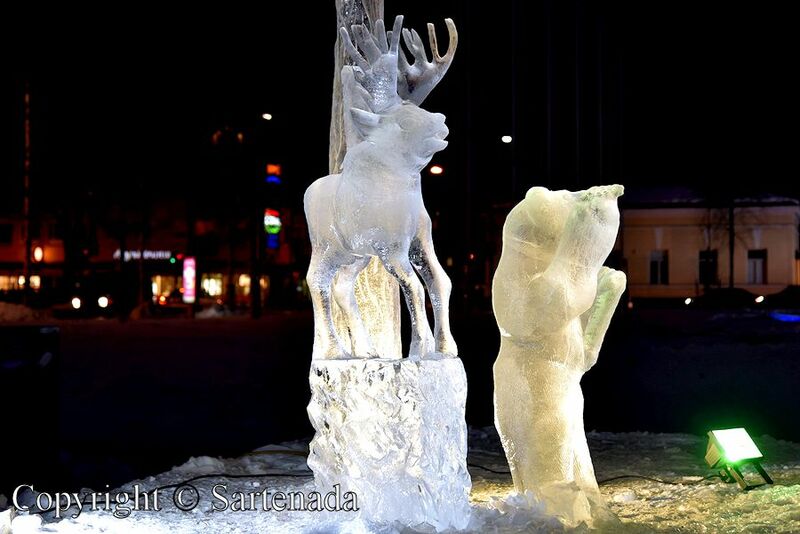 Helsinki is too warm, that ice sculptures could last many days. This not the worst problem, but people who vandalize these statues. 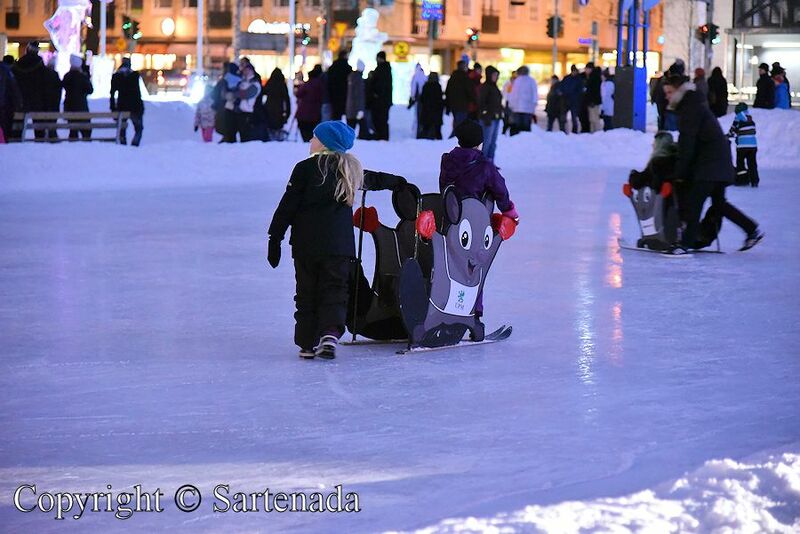 This was the case also in Mikkeli. Sigh. Those sculptures are absolutely amazing.